Aldo Brizzi: He was born in Alessandria, Italy, in 1960. He trained in classical music at the Milan Conservatory, and subsequently worked with Leonard Bernstein, Pierre Boulez, and Sergiu Celibidache. He holds a Laurea Degree from the DAMS Bologna. He has also worked with Giacinto Scelsi who has influenced his artistic direction. He has composed music for groups and orchestras, including the Strings of the Berlin Philharmonic and the Orchestre philharmonique de Radio France. His awards include the Venezia Opera Prima del Teatro La Fenice (1981), European Year of Music (Biennale di Venezia, Festival d'Automne in Paris, WDR di Cologne/Köln, 1985), Concorso nazionale Franco Evangelisti in Rome/Roma (1986), and the Young Composers' Forum in Cologne/Köln (1989). He was director of the Ferienkurse in Darmstadt from 1990 to 1994. In 2000 he jointly produced Cristal, a record by Ala dos Namorados (EMI), which won the Golden Disc award in Portugal. In the late 1990s and throughout the 2000s, Aldo Brizzi has moved into a more experimental direction by fusing different musical traditions and styles. This culminated in the widely acclaimed Brizzi do Brasil record, which won the Trofeu Caymmi in Brazil, come miglior disco dell'anno 2003. In 2005 he collaborated with Alfredo Arias on the musical Mambo Mistico (Théâtre national de Chaillot, Paris), which was awarded the best music/soundtrack prize in the 12th Cérémonie du Souffleur (2004–05). In 2007 he launched the Loving Glance project, experimenting with electronic music and the voice of Reis. He had developed a very characteristic style escaping genre categorization, including trip hop, drum and bass and classical music, combined with Afro-Brazilian sounds like bossa nova and Musica Axé. 2012 saw the première of his multimedia opera Alter in France. Giacinto Scelsi (b La Spezia, 8 Jan 1905; d Rome, 9 Aug 1988). Italian composer. Scelsi's extraordinary life encompassed many aspects of the intellectual, spiritual, social and musical life of the 20th century. He was born into southern Italian aristocracy, inheriting the title Count D'Alaya Valva, and as a young man travelled extensively, moving within Europe's most elevated social circles. His English wife, Dorothy (whose nickname ‘Ty’ figures in the titles of two of Scelsi's works) was a distant relative of the British royal family; their wedding reception was held at Buckingham Palace. His music attracted a number of prestigious performances, particularly in Paris where Pierre Monteux conducted the première of Rotative in 1930. During World War II he lived in Switzerland; after the war his wife returned to England, never to contact him again. He spent the latter part of his life in Rome, where his apartment overlooked the Forum. Much of the detail of Scelsi's life is shrouded in mystery, something he himself did much to encourage. It seems, however, that after some initial successes as a composer, he suffered a devastating mental breakdown between the composition of La nascita del verbo (1947–8) and the Suite no.8 ‘Bot-ba’ (1952). Scelsi's early compositional career had been a progression through some of the principal aesthetic tendencies of 20th-century music – futurism, neo-classicism, dodecaphony, surrealism – preoccupations fed variously by periods of private study with Respighi and pupils of Skryabin and Schoenberg, and by his friendships with Henri Michaux, Pierre Jean Jouve, Paul Eluard and Salvador Dalí. The later works reveal a new preoccupation with an obsessive reiteration of individual sounds, a legacy of the lengthy period of rehabilitation from his illness. Scelsi described how he would spend days repeatedly playing single notes on the piano, developing a new, intensely focussed mode of listening. The multi-movement form of many subsequent pieces can also be heard as an extension of this reiterative exploration – sequences of movements are intended not to provide contrast but to offer a repeated re-examination of the same sound object. Although Scelsi's music continued to attract occasional performances in the 1950s and 60s, his career was eclipsed by the emerging Italian composers of the post-war period, and his compositional concerns, as far as they were known, were regarded as of marginal interest. It was not until the 1970s that the significance of his work began to be recognized by a new generation. Younger composers, including the American Alvin Curran, the Prix de Rome guests Grisey and Murail, and the Romanian exile Radulescu, discovered in Scelsi's work aspects of the musical world which interested them, struck particularly by the concentration on gradual timbral transformations. At the beginning of the 1960s many avant-garde composers had begun to explore the inner life of sounds, writing music which focussed on small fluctuations within sustained sonic bands. What distinguished Scelsi's work from Ligeti or Cerha's scores of the period was the profound subjectivity of Scelsi's engagement with his material, an engagement in which abstraction seemed to play no part. In his most wholly characteristic works pitch, timbre, register and dynamics are heard as the inherent expressive potentialities of each sound, rather than as separate parameters to be controlled more or less independently. The Quattro pezzi (su una nota sola) (1959), for example, use microtonal pitch inflection, timbral transformation and rhythmic reiterations to animate the ‘note’ on which each movement is based, stretching its identity far beyond that of a mere frequency. Subsequent works explore this plasticity of sound yet further, drawing a handful of musical strands out of an initial tone and allowing them to diverge. Usually such divergence covers an interval of no more than a third, but it makes possible a beguilingly unpredictable harmonic architecture in works of the mid-1960s such as Ohoi (1966) and the Fourth String Quartet (1964), arguably Scelsi's finest music. Inevitably, given his microscopic examination of instrumental sound, intervals derived from the harmonic series predominate. His intuitively composed work can therefore be heard to anticipate later, more systematic developments: not only the ‘spectral’ music of the Itinéraire group but also the exploration of the pitch-timbre continuum in computer music. As word about this extraordinary, neglected music spread, performances and then recordings began to multiply. The critic Harry Halbreich was a persuasive advocate; promoters such as Adrian Jack at the Institute of Contemporary Arts in London, Wolfgang Becker at WDR and Ernstalbrecht Stiebler at Hessische Rundfunk organized portrait concerts of Scelsi's work. The Arditti Quartet took up the string quartets, Marianne Schroeder and Yvar Mikhashoff the piano music, and conductors such as Jürg Wyttenbach the orchestral works. This period of rediscovery culminated in the mid-1980s with belated first performances of many of Scelsi's largest scores, and triumphantly acclaimed presentations of Scelsi's work during the 1986 Holland Festival and the 1987 ISCM World Music Days in Cologne. The spiritual world of Scelsi's mature works is rooted in an exotic mix of pantheism and theosophy, derived from Gurdjieff, Blavatsky and Sri Aurobindo, but also stimulated by Scelsi's own visits to India and Nepal. Scelsi saw his work as straddling the aesthetic worlds of East and West, using the instrumental resources of the West in music whose meditative focus on individual tones has obvious links to both the monastic traditions of Tibetan Buddhism and the ison principle of Byzantine Orthodox worship. Elsewhere, particularly in the works of the late 1950s, there are elements of arabesque reminiscent of the folk music of the eastern Mediterranean. Scelsi claimed that ‘Rome is the boundary between East and West. South of Rome the East begins, and north of Rome the West begins. This borderline runs exactly over the Forum Romanum. It runs right here, through my drawing-room’. His titles offer further evidence: Aiôn (1961) is subtitled ‘Four Episodes in a day of Brahma’, Anahit (1965) is ‘A Lyric Poem dedicated to Venus’, Pwyll (1954) is a Welsh druidic term, while the title of Konx-om-pax (1969) brings together the ancient Assyrian, Sanskrit and Latin words for ‘peace’. Scelsi's approach to composition was itself hybrid: for him music was not a communicative medium but something immanent, revealed through the creative process. His reluctance to describe his working methods as ‘composing’ stemmed from the belief that music passed through him; it was not something ‘put together’ by him. Indeed the working method of his mature years was unusual, depending primarily on the selective transcription of improvisations made in a quasi-meditative state. He would perform these improvisations generally at the keyboard, either the piano or, in later years, the Ondiola, a three-octave electronic instrument with a rotary attachment for producing microtonal inflections. Scelsi would also invite performing musicians who showed a particular affinity for his work to improvise for him, painstakingly refining their instrumental resources for the sound-world he wanted, so that works such as the Canti del capricorno (1962–72) or the cello Trilogy (1956–65) became intimately associated with their first interpreters, the singer Michiko Hirayama and the cellist Frances-Marie Uitti. Each improvisation was recorded (the process of cataloguing the tapes was begun after Scelsi's death) and the most successful improvisations were then transcribed and realized as instrumental scores. Exceptionally, some improvisations were used more than once: the Fifth String Quartet (1984) and the amplified piano work Aitsi (1974) are both transcriptions of the same tape. The actual writing of the scores was undertaken by an assistant, working under Scelsi's direction. After Scelsi's death his most frequent collaborator, Vieri Tosatti, revealed the extent of his involvement in the making of Scelsi's scores, claiming that he had worked with Scelsi since 1947 and had written out all his major works since then. The discovery that Scelsi was not the sole author of his scores has troubled some critics who, associating it with his lack of a conventional compositional apprenticeship, have accused him of dilettantism, even of a sort of artistic fraud. Scelsi's collaborative approach was, however, consistent with his compositional philosophy, as was his reluctance to make public appearances at performances of his work, and his refusal to be photographed. By the time of his death his music had achieved an eminence which its composer resolutely rejected for himself. Horatio Radulescu (b Bucharest, 7 Jan 1942 - d Paris, 25 September 2008). French composer of Romanian birth. He studied the violin privately with Nina Alexandrescu, a pupil of Enescu, and subsequently composition at the Bucharest Academy of Music (MA 1969), where his teachers included Niculescu, Olah and Stroe, some of the leading figures of the newly emerging avant garde. In 1969 Radulescu moved to Paris (he became a French citizen in 1974); here, initially inspired by Stockhausen, he began to develop his version of Spectral music. In the early 1970s he attended classes given by Cage, Ligeti, Stockhausen and Xenakis at the Darmstadt summer courses, and by Ferrari and Kagel in Cologne; later, from 1979 to 1981, he studied computer-assisted composition and psycho-acoustics at IRCAM. From the mid-1970s Radulescu's works were performed at leading European festivals including La Rochelle, Metz, Royan and Donaueschingen; in 1983 he founded the ensemble European Lucero in Paris to perform his works, and in 1991 the Lucero Festival. His many awards include a DAAD composer residency in Berlin (1988–9) and a French Villa Medici fellowship (1989–90). The essentials of Radulescu's compositional thinking are expounded in the booklet Sound Plasma: Music Of The Future Sign (Munich, 1975). Asserting that the historical categories of monody, homophony, polyphony and heterophony were by then exhausted, Radulescu replaces them with the concept of sounds in a constant state of flux. The resulting ‘sound plasma’ is articulated, above all, by the periodic or aperiodic appearance and disappearance of particular spectral components, in which dynamics and timbre (especially transitions between clear pitch and noise) play a fundamental role; this constitutes a ‘spectrum pulse’. For Radulescu, the notion of ‘sound plasma’ also implies an almost neo-Boethian distinction between ‘planetary’ and ‘cosmic’ music. It is this aspect – in many respects akin to Stockhausen's outlook – that most clearly distinguishes Radulescu's music from the ‘instrumental synthesis’ (also spectrally based) pursued by composers like Grisey and Murail from the 1970s onwards. While the latter composers' work is in some respects scientific and clinical, expounding clear acoustic processes, Radulescu's aims are essentially spiritual and magical, drawing not only on Catholicism but also on Daoism (in particular, Laozi's Daode jing). From the start, Radulescu's music was extravagant in its conception, duration and means. Its religious aspirations are already evident in early titles such as Flood for the Eternal's Origins (1970) and Everlasting Longings (1970), and also in use of ‘sound icons’ (grand pianos laid on their side, and played with bows or gold coins). As for duration, his first spectral piece, Credo for nine cellos (1969) lasts 55 minutes, while Wild Incantesimo (1978) lasts nearly two hours. The latter work also calls for enormous resources: nine orchestras, whose music is projected on 19 screens using over 4400 slides. Other instances of unusual resources include Byzantine Prayer (1988) for 40 flautists playing 72 flutes, and Do Emerge Ultimate Silence (1984) for 34 children's voices with 34 monochords; in both these works, Radulescu explores large ensembles, whose constituent instruments possess similar basic spectra. String instruments play a central role in Radulescu's work. This partly reflects their capacity to make pitch–noise transitions by moving the bow towards and away from the bridge, but above all for their flexibility of tuning. Most of Radulescu's works for strings call for a ‘spectral scordatura’ in which each string is tuned as an overtone of a low (sometimes sub-audio) fundamental. A particularly spectacular instance is ‘infinite to be cannot be infinite, infinite anti-be could be infinite’ (String Quartet no.4) (1976–87) for nine string quartets, eight of which may be prerecorded; here each of the 128 strings of the prerecorded quartets has a separate tuning. For many of these works, conventional notation is inadequate, and Radulescu has devised his own forms of graphic or ‘action’ notation, sometimes involving the use of several different colours. In most of Radulescu's music, melody per se plays little or no role; form is articulated in terms of changing registers and densities, and evolving spectral and timbral qualities. However, in some works of the 1990s, and especially those for piano (sonatas nos. 2 and 4, and the Piano Concerto), Radulescu has sought, with success, to integrate elements such as Romanian folk melodies into a spectral context. Nicola Cisternino (born in San Giovanni Rotando, Foggia, Italy, 1957), graduated from the Conservatory of Parma and obtained a degree from the Institute DAMS (Disciplines of Art, Music and Spectacle), University of Bologna. He has also studied analysis and composition with Sylvano Bussotti at the Flessole and Genazzano schools of music. Since 1980, his compositional interests have centered on new musical notations, elaborating his own graphic-sonic universe (sonic graffiti), which have been shown and performed with the rest of his works in many cities, such as Matera, Rome, Venice, Bologna, Montepulciano, Turin, Rouen, Paris, Heilbronn, Bucarest, Orléans and various others. In 1993, his composition, Awithlaknnal, began a nocturnal concert of the SIMC (Internationnal Contemporary Music Society) at the archeological site of Teotihuacan, near Mexico City. In 1997 and 1999, he was invited to be a resident composer at the Ateliers UPIC. His research studies and musical articles are published in Alphabeta, Les Cahiers du Cirem, Cidim, Musicattuale, and Konsequenz. He published with Pierre-Albert Castenet the collection: "Giacinto Scelsi: Voyage to the Center of Sound". In the summer of 1997, he was asked by the famous popular musician Franco Battiato to produce two days of concerts of Scelsi's works, which were then performed by the Arditti Quartet and the contrabassist Stefano Scoddanibbio at the festival of Fano. Two monographic compact discs feature his works. The first, by the New Contemporary Ensemble of Rouen, was released in the collection "Music of the XXth Century" by the University of Haute Normandie of Rouen in 1994. The second was included as part of a monographic catalogue of his "Sonic-Graffiti" (Luna Edition) in 1997. Artistic and sonic director of the Brake Drum Percussion Ensemble, he conceived and realized the SONOPOLIS project, "Integrated Journeys into the Music of Today", which has been performed in the region of Veneto, produced by the great theater, La Fenice, in collaboration with the city and the University of Venice. 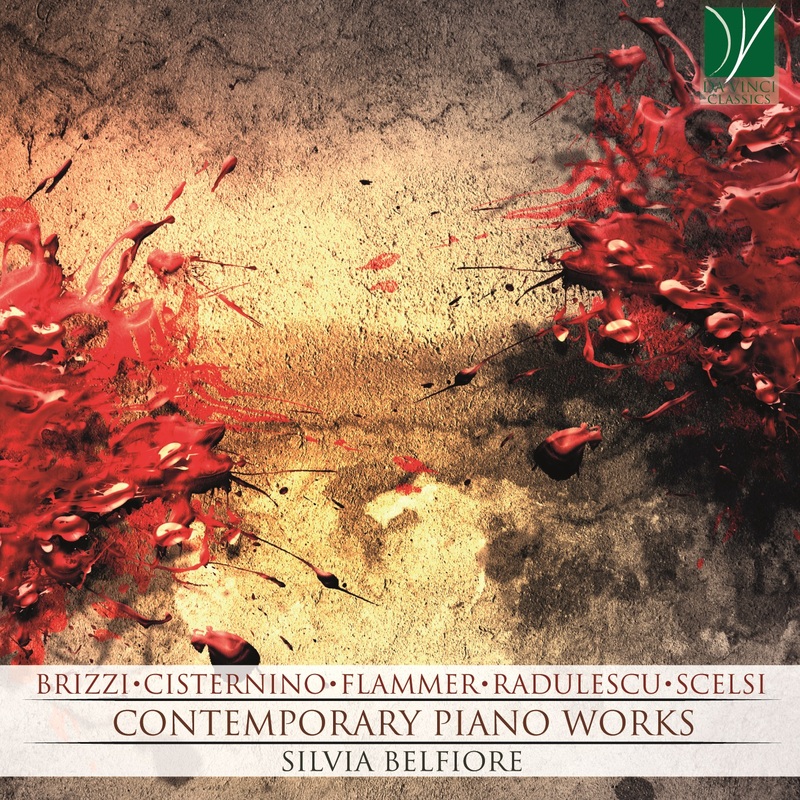 Silvia Belfiore graduated in piano from the Conservatory of Alessandria with Massimo Paderni. She has a Degree with maximum marks in Musicology from the University of Bologna followed by various courses of specialization with Szidon, Kontarsky, Micault, Damerini, Masi, Gottlieb, Celibidache and Rattalino. Actually, in Paris, she's involved in a Master in the Universitu Paris 8, Music Department (prof. Antonio Lai), with the thesis: Écriture et oralité dans la musique africaine actuelle. Compositeurs contemporains de l’Afrique sub-saharienne du nord-ouest. After winning a scholarship, she participated in “Ferienkurse fur neue Musik” in Darmstadt in 1986, 1990 and 1992. She has also received various awards for her artistic achievements. She recorded for the state television in Moldavia, Globo television in Brazil, Bavarian Radio and RaiRadio3. She recorded 12 CDs as a piano soloist and in chamber formation with a classical and contemporary repertory. Because of her talents and interest in new music, many composers (Helmut Bieler, Mauro Bortolotti, Aldo Brizzi, Nicola Cisternino, Aldo Clementi, Gianvincenzo Cresta, Giorgio Ghisetti, Stefan Grové, Horst Lohse, Martin Kürshner, Diego Macías Steiner, Fred Onovwerosuoke, Biagio Putignano, Godwin Sadoh, Gerardo Tristano, Anatol Vieru, etc.) have dedicated their works to her. She’s also involved in research and census taking of musical assets for the “Istituto per i beni musicali in Piemonte”. She teaches piano at the Conservatory ‘Vittadini’ in Pavia as well as hold workshops and masterclasses at various institutes, music schools and universities in Italy, Portugal, Brazil, California, Ivory Coast, Spain, Tanzania, Togo. For her interest in the most varied forms of expression and artistic collaboration, she has had more than 500 concerts as a soloist and in chamber formation in Brazil, Ethiopia, France, Germany, Greece, Hungary, India, Italy, Ivory Coast, Kenya, Mexico, Moldavia, Peru, Poland, Portugal, Romania, South Africa, Spain, Switzerland, Tanzania, Togo, United Kingdom, United States. Since 1998 she has been the artistic director of “Omaggio a…” an international festival of contemporary music in Acqui Terme (Italy).